So since the last time I posted several things have happened. One, I’m finished classes until January. I passed my courses with flying colours and I’m still thoroughly in love with being a nurse. Two, I started my first sweater. It’s not finished yet, mostly because I got bored after knitting for two weeks straight on one project. Three. I started two pairs of socks. The Up North booth Socks, and the Thuja socks. Both are in the same place. I couldn’t finished them without more yarn which I just purchased yesterday. Four deserves an entry all it’s own. 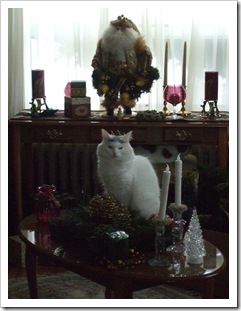 Right now I will leave you with Sammy on the coffee table. I’ve been getting so much the past couple of weeks, but I haven’t really had time to do much of anything. I have been pretty busy with school, so being on the computer has played second fiddle to knitting. So far I’ve been pretty productive, I have finished two hats, a pair of mittens, started a cable scarf [my first cable pattern] and I’m currently working on my first sweater. I had actually finished more projects this month than in the last year combined. The sweater I’m knitting, is from the cherie-amour on Knitty.com, from our fall 2007 collection. If a scene a bit distracted, it’s because I am currently using the speech recognition feature of my laptop, because I cannot stop what the needles down. So far, I’m on a row 15 of 33 of the lace pattern in one. Hopefully, I will have pictures up very soon of the sweater and also of the other finished objects. In other news, I have an abscessed tooth, that is currently giving me fits. I saw my Dr. This morning, and he gave me a prescription, thankfully the painkillers are actually helping. The problem is, I’m in pain and talking makes it worse. So I’m going to leave you all with this, and feel free to check out my Ravelry page I have a few pictures up there. I started the Booga Bag last night. Very simple pattern, though I had to learn how to pick up a selvedge edge pretty quickly. 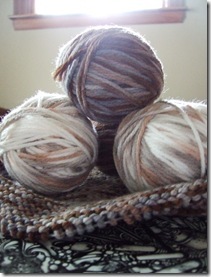 The yarn I’m using is Sean Sheep, in either hero tones or armytage, I’m not sure. The main colour is bark, and I’m using natural for two bands one on the bottom edge and one on the top edge. I don’t think the bag is going to felt very well. Acrylic yarns never do, or so I’ve heard, but it should block properly and will still be awesome even if it doesn’t felt. I’ll post more photos as I continue the project. 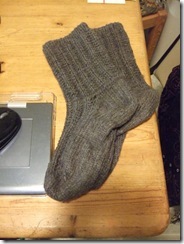 Last Christmas I decided to make a pair of socks for my father. I found an interesting pattern, and went on my merry way. I found out a lot about knitting when I was working on these socks. The first thing, I absolutely love knitting in the round. The first two rows are always annoying and I feel like an octopus who can’t use their tentacles properly. But that feeling disappears by the third or fourth row. Secondly, turning a heel is easy. The second I started knitting the short rows I was in heaven. 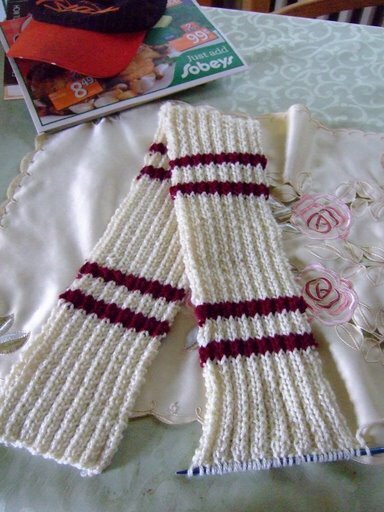 The pattern itself is a simple mistake rib worked over an even number of stitches. 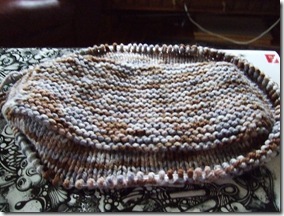 The yarn I used was Paton Wool Merino in a dark grey mix. It’s a wonderful yarn, warm and perfect to knit with. but the next time I knit a pair of socks I’m going to be looking for a super wash so I can toss them in the washer. Scarves and why I hate them. So this is my new knitting blog. First a brief introduction. My name is Ryan, and I’ve been knitting for a little over a year. As you can probably guess by my title I’ve been knitting a lot of scarves. In fact that’s probably all I’ve been knitting since I began last year. They’re a great beginner project, but I don’t know, I guess my main problem with them is that that they’re not a quick project. You’re stuck doing the same pattern for what seems an eternity. I suppose they’re great for gifts (especially since I live in such a frigid climate). But I always come back to hating them. It took me eight months to finish me cousin’s scarf. And I’m stalled on my friends. Overall I’m in a scarf rut. I want to try something bigger, a sweater or blanket maybe? But I’m worried I’m not skilled enough for a sweater and while I have started a blanket, I have to frog some of it all ready because the stitches are bunching on one corner. Can anyone tell me how to pick up a selvage edge? I’m swimming in uncharted territory.